Because Haute Route is imminent, and my body is about as ready as I can make it, I am turning my attention to the bike over the next couple of weeks. I’m starting with my chain, which I thought was doing pretty well (about 6000 km since the last change), but wasn’t sure. Well, I am now, thanks to the newest addition to my tool bag – the Park Tool CC-2. 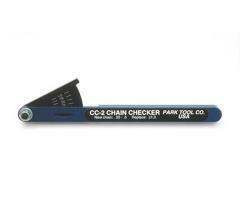 It’s a chain checker that accurately measures the amount of chain wear you have. I won’t go into the details on how to use it – that’s what YouTube is for – but I just thought I’d throw this out there in case anyone is forgetting about this all-important component of your bike. If your chain wears past a certain point, you will lose power in your pedal stroke, not to mention the very real possibility of damaging your chainrings and sprocket (and anything else it rolls around, I guess). Keeping your chain clean (I give it a wipe nearly every ride) and remembering to change the thing once in a while will prolong the life of your bike and make you go faster, as a bonus. This has been a public service announcement from your friendly neighborhood ‘wrench’. P.S. The CC-2 tells me that my chain is nearly as tight as when I bought it…must not be pushing hard enough. A poor man’s chain checker is a simple ruler in inches. Place the zero over one rivet and check where the 12″ mark is. If it is in the center of the rivet then your chain is ok, if the rivet is less than 1/16″ past the mark, your chain is ok. If it’s between 1/16″ and 1/8″ past the mark you’ll likely need a new chain, but your sprockets should be ok. If it’s more than 1/8″ past the mark, you’ll probably have to replace both the chain and cassette. I got this from http://cyclingtips.com.au/2009/03/how-to-check-for-chain-wear/ but it is all over the web. I waited too long to change the chain on my ’79 Fuji Royale and had to change the freewheel as well as the new chain was skipping on the old freewheel in low gear. Luckily I can still find them on ebay. There are lots of cheaper options than what I went for, the ruler being the most reasonable. In my brief experience, keeping the chain clean is far more important a prevention job here. I’ve had chains that have lasted years because I headed the advice of Lennard Zinn long ago. You need a question and answer page…..for questions like this… I saw an oliptical main gear on the TDF race… and I was wondering what is it’s benefit and had you ever looked at it? I’ve seen them off and on over the past few years (SKY use them), but really don’t know the benefits of them yet. I’ve often wondered how smooth the stroke would be, but it must be more consistent than what an oval chain ring would suggest! I get the feeling that elliptical rings are like those time-trial helmets with the ‘long-tail’ on them; they work well for the top specialists in the discipline. Gerry: any idea how we will clean our bikes during the HR? From what I gather, we will drop our bikes at the “bike park” near the finish of each day and pick them up there the next morning. I would like to clean and lube my chain, but does that mean I would need to put the degreaser or cleaner and lube in my daypack? Or would the Mavic guys clean/maintain the bikes (I would be surprised if they did that for 600 bikes)? Jan, I can take a guess, but that’s all it would be: I doubt very much anyone will be cleaning our bikes. Not only would it be a massive undertaking, most of us are pretty particular about the way it’s done. I’m taking my degreaser, rags, and lube with me.